Maximize the power in your LS Swap - Heads are a huge part of your success. Let's get your flowing more today! The standard issue LS1 heads is best all-around head for the street / strip engines . A thorough porting and milling job plus a valve upgrade on these will really wake up your engine.The heads have undergone only minor revisions since their introduction in 1997 , most notably a switch from perimeter to center valvcover bolt configuration for the 1999 model year. Each style has its own dedicated valvecovers and coilpacks mounting apparatus. 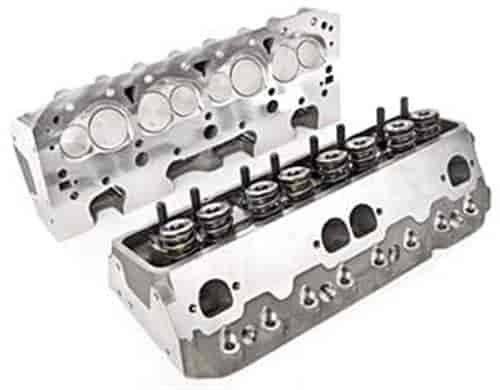 The LS6 cylinder heads is essentially a tuned-up version of the LS1 head. At 65cc, the combustion chamber is slightly smaller and more efficient than the LS1. The more efficient design shortens burn times and ultimately means less ignition timing advance is required to produce the same power. And because less timing allows more efficient combustion, the Ls6 heads allow the engine to produce more torque. The exhaust port is a unique D-shape that improves flow. LS6 heads are the best choice only when all-out power is needed. Be prepared for a big price tag at the dealer or steep core charge from your head porter. These small combustion chamber truck heads offer no advantage over an LS1 head except the smaller combustion chamber. This along with milling of the deck surface will allow a slightly higher compression ratio to be achieved. Because of the smaller intake valve installed in these heads a valve upgrade is practically mandatory. The LQ4 heads are found on the low-performance version of the 6.0-liter truck engine. They offer a large combustion chamber that lowers compression ratio making them perfect for a forced induction application. Swapping on the LQ4 head drops the compression ratio of a typical LS1 engine to 9:5.1 Cast-iron casting are heavy! The LQ4 head received aluminum heads starting in models year 2001. All other features are the same as previous years iron heads. This is the workhorse head for street / strip turbo and blower cars.